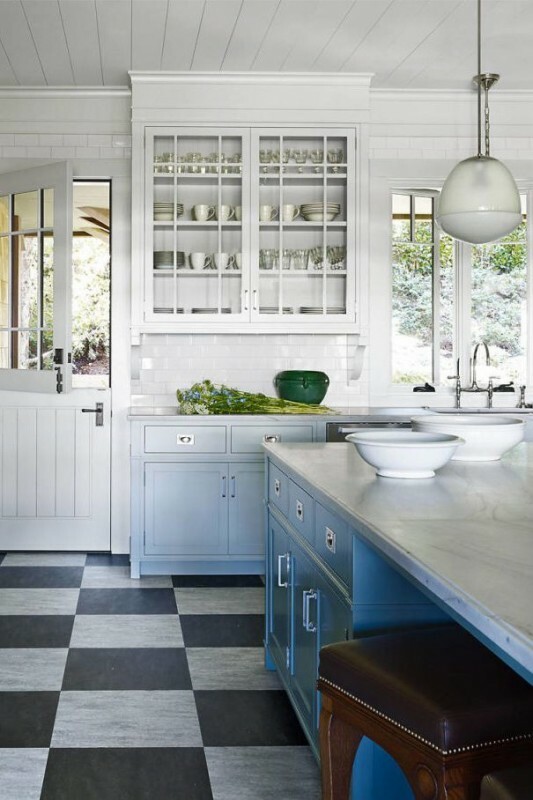 This black and white kitchen by Eva Quateman features a bold checkered tile floor, which adds visual interest to the design. 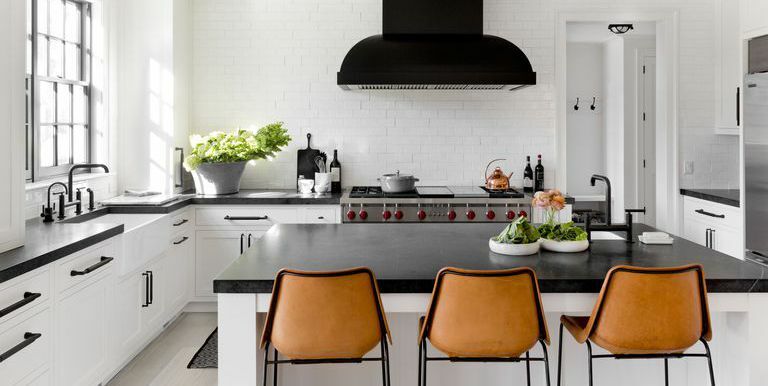 In photographer William Abranowicz's Westchester ranch house, pendant lights by Produzione Privata hang above the marble-top kitchen counter, adding a clean, minimalistic accent to the black and white space. 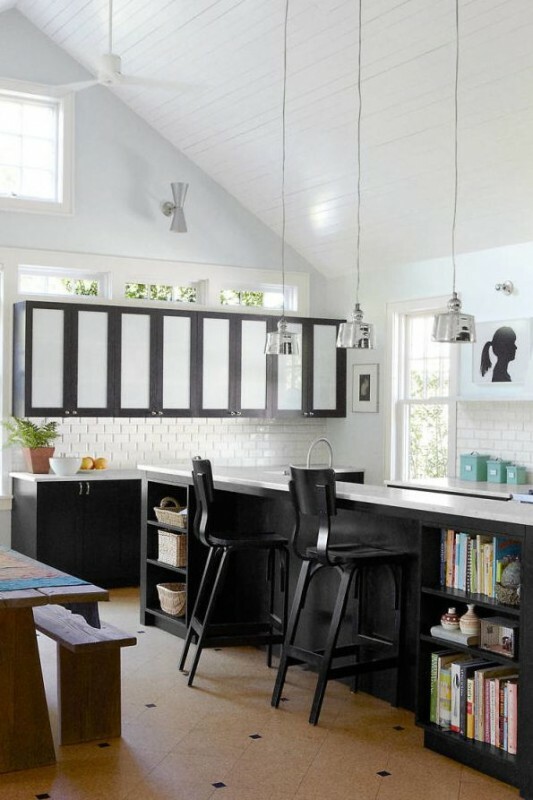 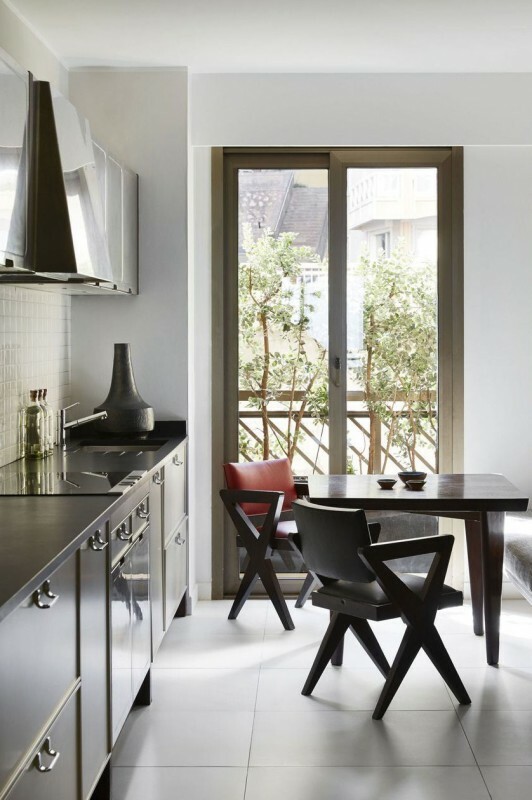 The black bar chairs are by Thonet and the milk glass-lined cabinets are custom made. 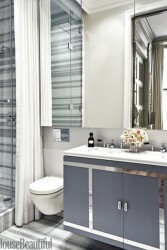 The backsplash tiles are by Waterworks. 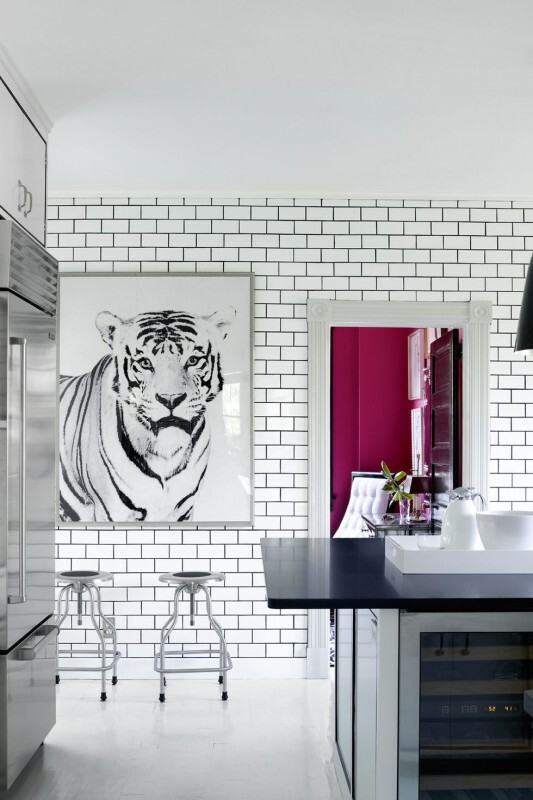 Charcoal subway tile creates a moody ambience in a stylish kitchen by CK Interior Design. 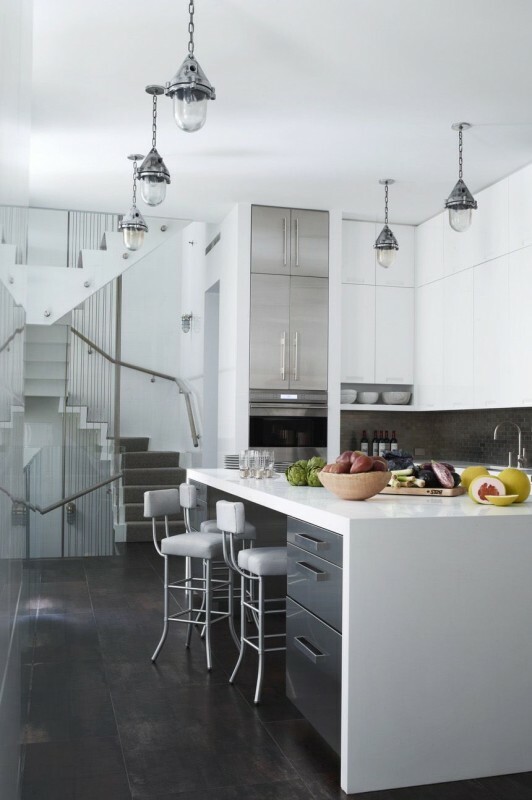 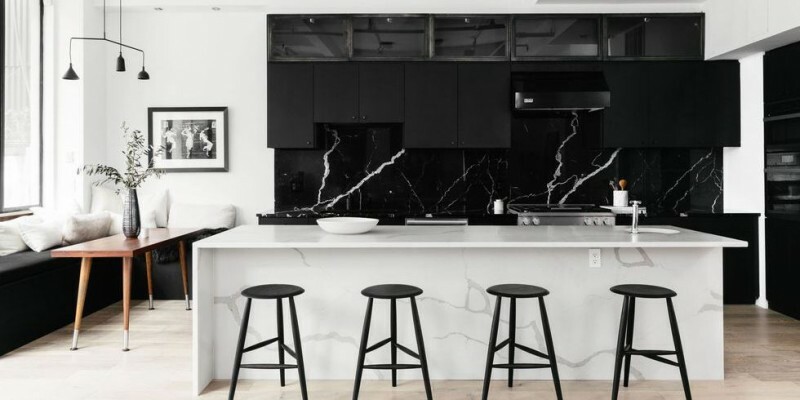 Designed by firm Ashe + Leandro, this Manhattan loft kitchen belonging to Coldplay's lead guitarist Jonny Buckland and his family blends natural materials with modern finishes, embracing a black and white aesthetic with touches of rustic appeal. 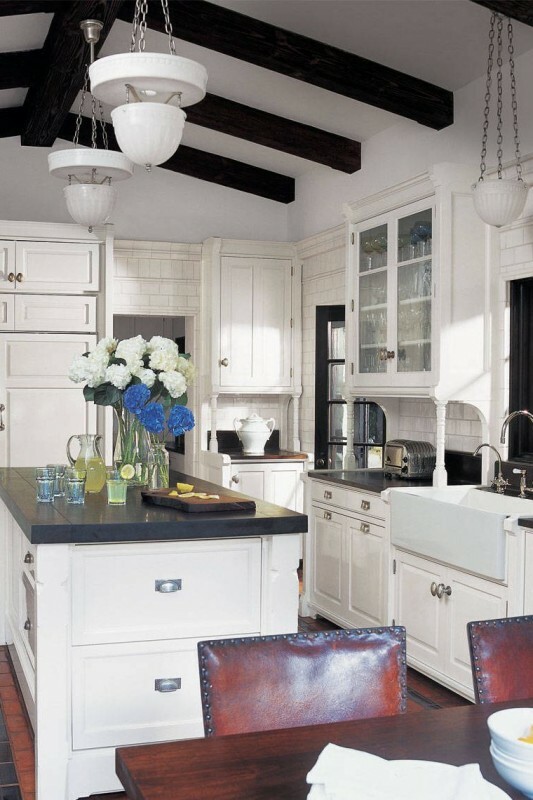 Leather-upholstered barstools provide seating around the room's mahogany butcher. 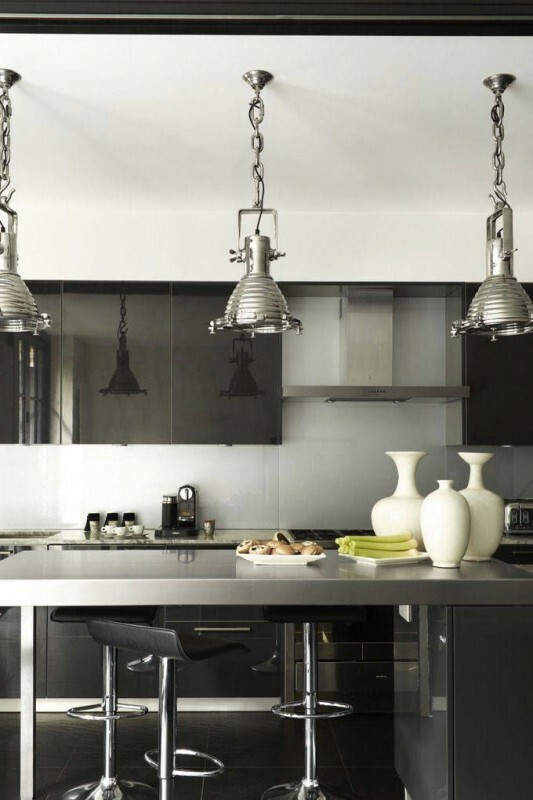 Hostess Rena Abboud's black-and-white kitchen is ideal for elegant evening socializing with its elegant brushed-metal island. 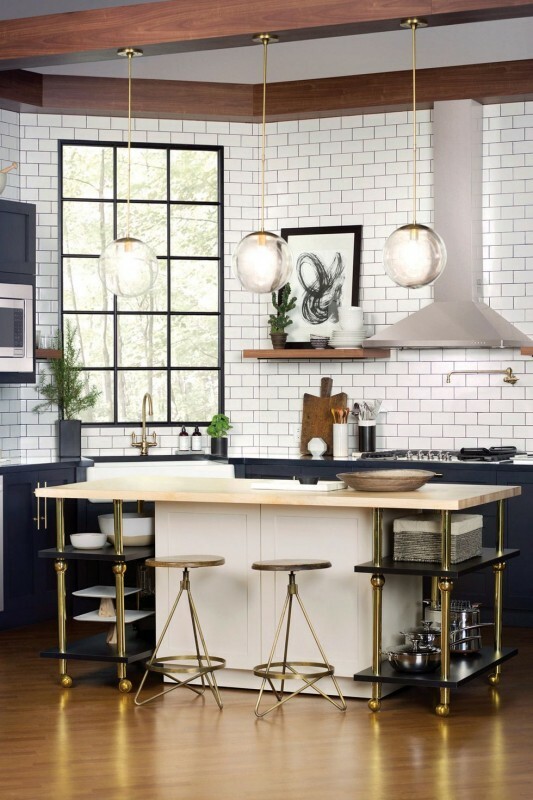 The stools are Lamboro and the pendant lights are Eichholtz. 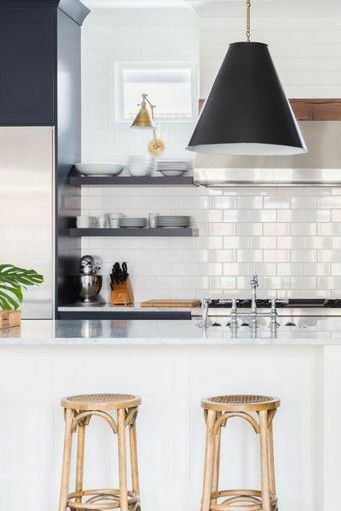 In this New York townhouse's black and white kitchen, the sleek pendants are from a Czechoslovakian factory and the 1940s stools are by Warren McArthur. 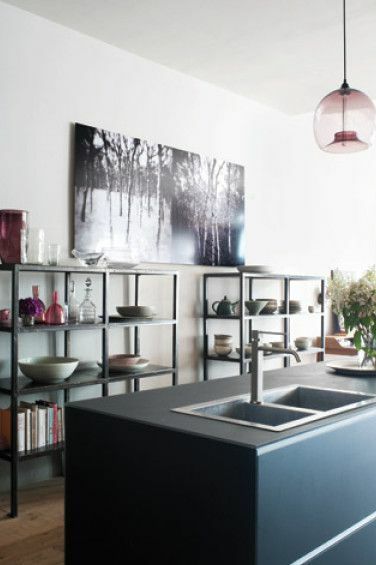 The oven is by Wolf, the floor is lined with Corten steel tiles and the staircase is suspended from cable supports. 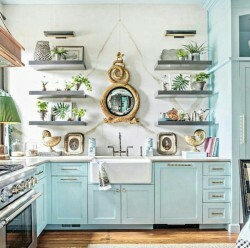 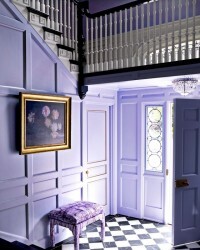 In this Beverly Hills cottage belonging to designer Madeline Stuart, a lover of the Arts and Crafts movement, the kitchen's cabinetry is custom made and the flooring is Marmoleum. 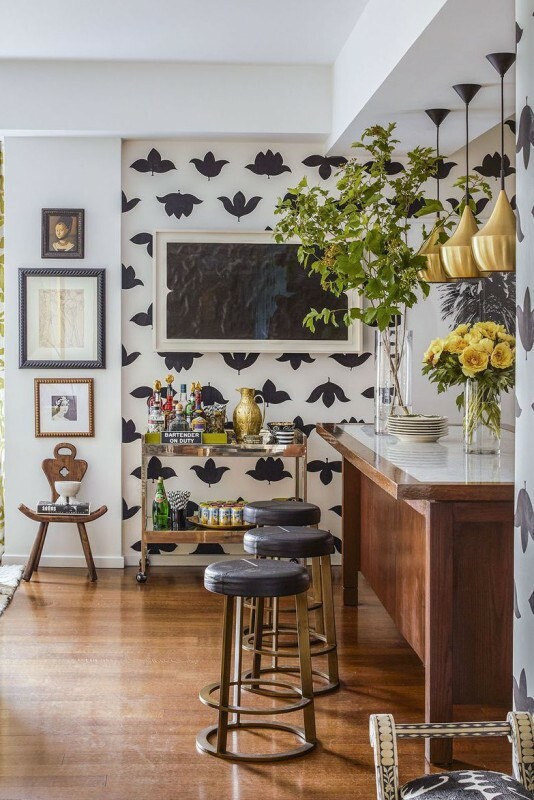 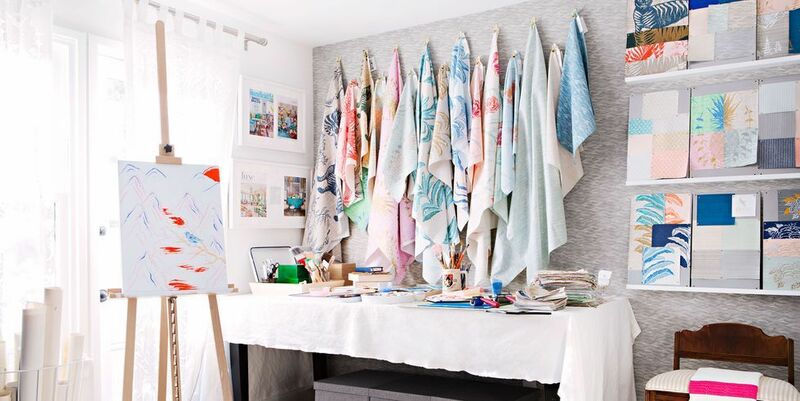 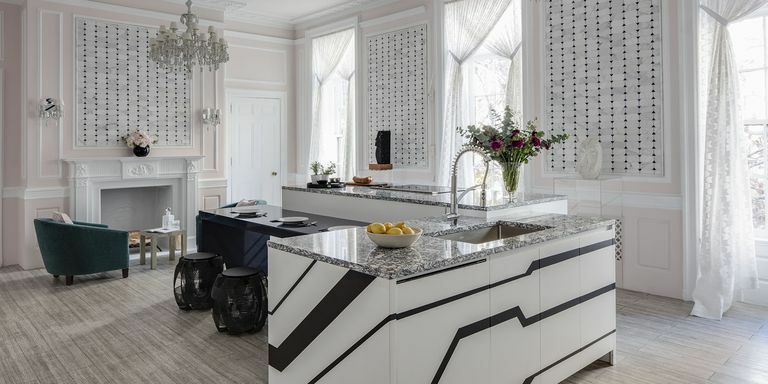 In this Hamptons home of Oscar de la Renta's young executive Erika Bearman, decorator Miles Redd created a black and white kitchen that exudes vibrant personality. 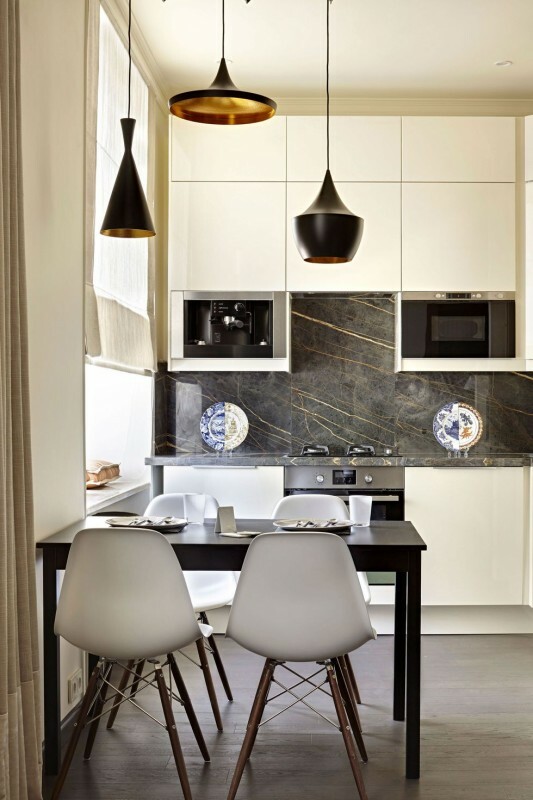 The kitchen's stools are by Design Within Reach, the ceiling fixture is from YLighting, the refrigerator and wine cooler are Sub-Zero and the photograph is from Natural Curiosities. 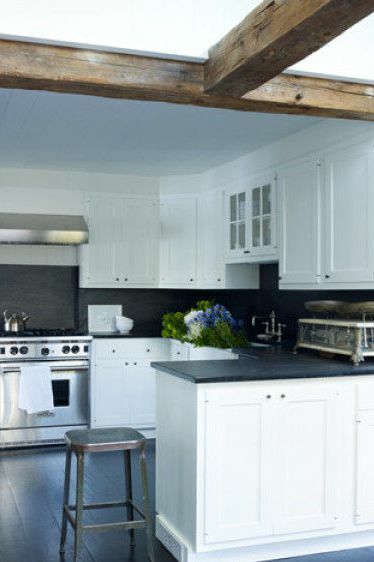 In this graphic kitchen designed by Darryl Carter, wood beams keep the black and white aesthetic from appearing too stark. 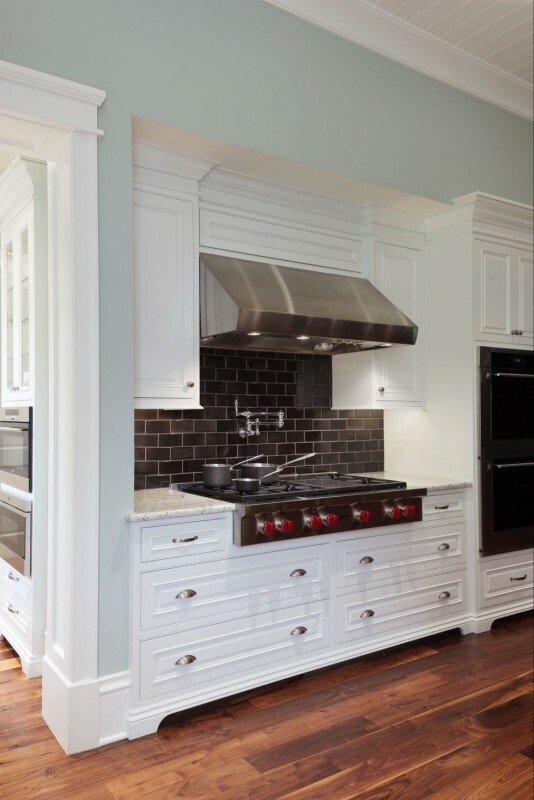 The kitchen's range and vent hood are by Wolf and the sink fittings are by Waterworks. 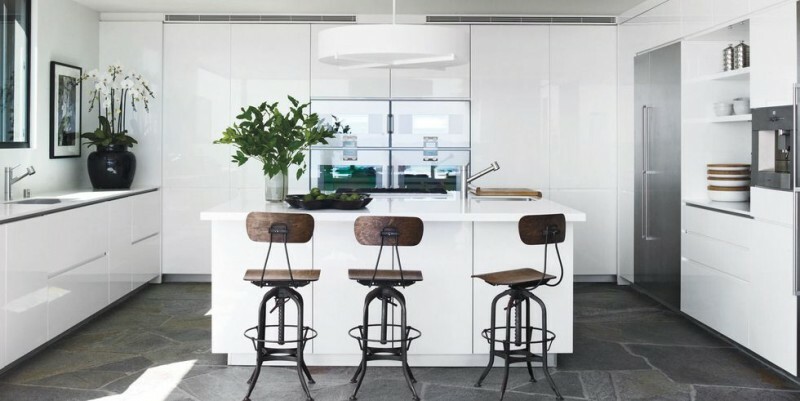 In Courteney Cox's Trip Malibu home, wood-and-steel bar stools bring rustic flair to the black and white kitchen. 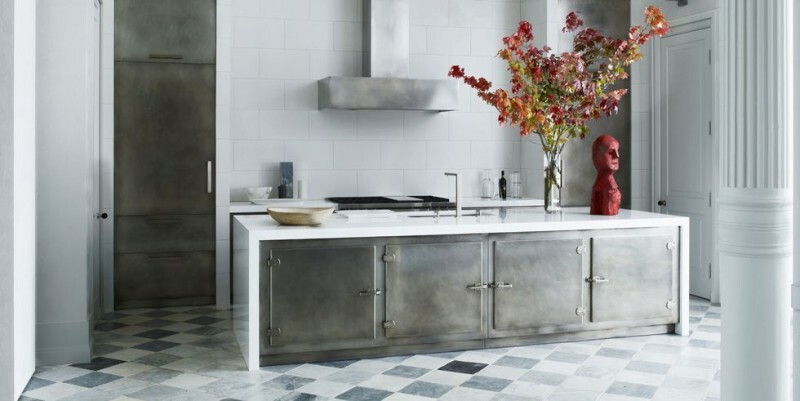 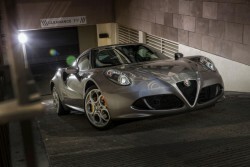 Countertops are by CaesarStone, the ovens and a refrigerator are by Gaggenau and stainless-steel sinksare by Franke. 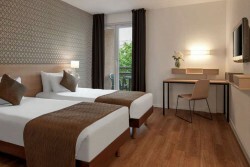 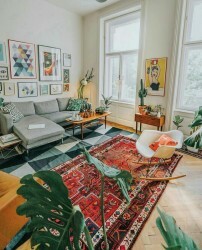 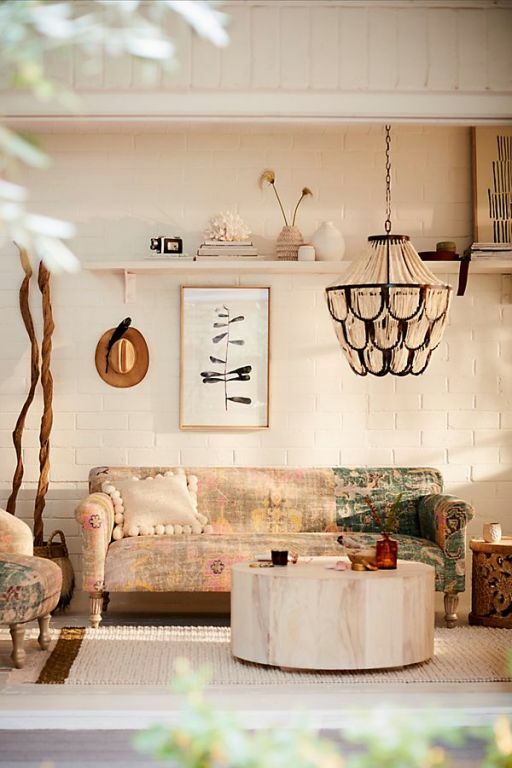 The light fixture is from Nessen Lighting.